Through adversity comes perspective and, hopefully, healing. Original Adrenaline Mob members, guitarist Mike Orlando and vocalist Russell Allen (Symphony X, et al) took the loss of friend and Mob drummer A.J. Pero very hard. The tragedy led to questions about the future of the band, so a hiatus ensued. But now Allen and Orlando return with a renewed spirit, a new band (Jordan Cannata, drums and David Zablidowsky, bass), and a new album We The People. 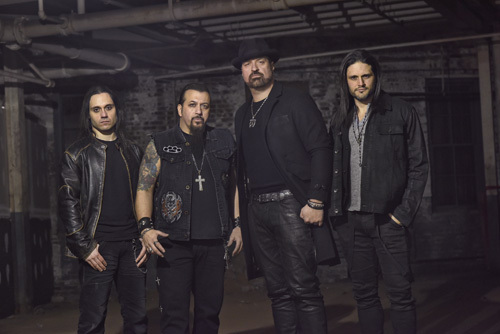 As you probably know the Adrenaline Mob sound is something of a hybrid of genres. They blend elements of hard rock, traditional heavy metal, alternative metal, melodic hard rock, and even some AOR into their tunes. The result isn't so much eclectic, but varied in presentation. By example there's an interesting progression or transition, at the start of the album. Both King of the Ring and We The People have a taste of modern alt metal's bristling harshness twisting with the melody. Then The Killer's Inside turns more upon classic heavy metal with good groove, a catchy chorus, and abundance of flaring guitar lines. The following Bleeding Hands transitions into pure melodic hard rock with an AOR accessibility and groove. It's the lightest song here. That pattern doesn't necessarily repeat itself, but it does show the degree of variation. Other twists come with speedy and feisty What You're Made Of, something of a speed metal rocker. The riffs, rhythm, and groove of Raise 'Em Up are balanced upon blade of metal heaviness and hard rock groove for an arena anthem. Lords Of Thunder will trick you with its piano and orchestration at the start, only to lead into some charging power metal with some screaming guitar riffs and leads. And, perhaps for the fun of it, there's Adrenaline Mob's heavy metal version of Billy Idol's Rebel Yell. I liked it, and I'd like to see Allen do Idol's curled lip snarl. 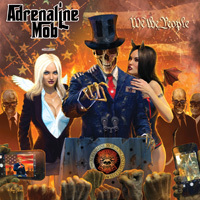 Needless to say, Adrenaline Mob's We The People is a fine return to form, classic heavy metal twisted with some alt metal and melodic hard rock. The album will be dedicated to late A-Mob drummer A.J. Pero, and it's a worthy tribute. Recommended. Adrenaline Mob's We The People is a fine return to form, classic heavy metal twisted with some alt metal and melodic hard rock. The album will be dedicated to late A-Mob drummer A.J. Pero, and it's a worthy tribute. Recommended.